Posted on March 8, 2010 by Alicia Bay Laurel	in Blog. Quinoa (pronounced “KEEN-wah”) is a good-tasting high-protein grain of the same family as amaranth. Steam a variety of vegetables together until fork tender. Tonight my mixture is: three broccoli crowns cut into branches, three broccoli stems, peeled and cut into half inch sections, one big carrot, scrubbed and cut into half inch sections, one big parsnip, scrubbed and cut into half inch sections, one big yellow onion, peeled and cut into one inch sections, and two yellow patty-pan squash, washed and cut into bite-sized pieces. Some other possibilities are brussels sprouts (stemmed and cut in half), zucchini (washed and cut into half inch sections), string beans, washed, ends trimmed off and cut in half, crookneck squash, washed and cut into half inch slices, red or white cabbage cut into bite-sized pieces, or cauliflower, broken into flowerlets. Set aside the steamed vegetables and save the cooking water separately. Quinoa is cooked at a proportion of one part grain to two parts water. One cup of dry quinoa makes enough for two generous servings. For three people, for example, use one and one half cups of quinoa and three cups of water. Measure the dry quinoa into a large strainer and let cold water run over it until it stops bubbling. Place the quinoa into a pot (use a 2 quart sized pot for 2 to 4 servings) and measure the vegetable cooking water into the pot. Place the cover on the pot, bring it to a boil, and turn the heat down very low and let the quinoa cook until all of the liquid is absorbed (10 to 15 minutes). 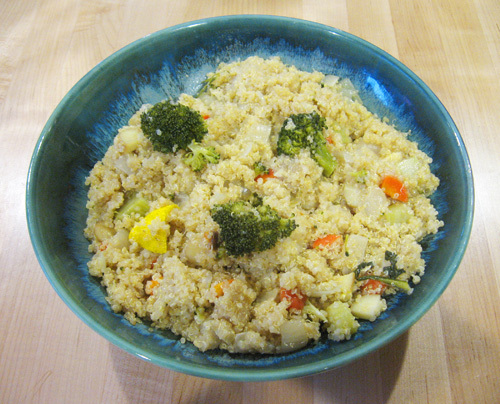 Turn the quinoa out into a large festive serving bowl, pour the steamed vegetables on top of it and toss gently. At this point you can season it according to your preference, or let each person season his or her own portion. I like a little extra virgin olive oil and Bragg’s Liquid Aminos on mine, but others might prefer tamari, gomasio, toasted sesame oil, sea salt, or parmesan.